GOLDEN AGE SUPERMAN PAGE 10 (1944). Media Type: Pencil and Ink. Artist(s): Joe Shuster Studio (pencils & inks). With a storyline and art this super, it's hard to believe that only after being turned down by every other publisher, DC printed the first Superman story in 1938, comprised of panels from the series of rejected comic strips that Siegel and Shuster had shopped around to no avail. By the time this beautiful page as drawn, the two creators had established themselves as comic book super-stars! 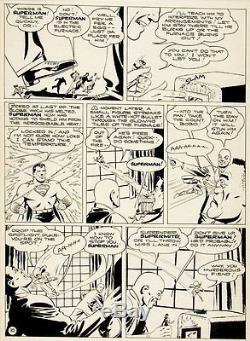 This INCREDIBLY RARE 1944 Unpublished Superman Page was created by Jerry Siegel, with Joe Shuster and the Joe Shuster Studio! Only a handful Golden Age Superman art pages have ever surfaced since the creation of Superman in 1938! This EXCELLENT action page is from this incredible story, titled: Supermite! Superman kicks some serious behind here in this Golden Age donnybrook. Meanwhile Luther snatches up Lois as a tiny hostage -- it doesn't get much more exciting than this pulse-pounding page of Golden Age greatness as superman appears in 5 all out battle panels! This "SUPER" page has an image area of 13 by 18 inches. The item "Shuster Studio GOLDEN AGE SUPERMAN PG 10 Original Art (1944)" is in sale since Wednesday, July 23, 2014. This item is in the category "Collectibles\Comics\Original Comic Art\Interior Pages". The seller is "romitaman" and is located in Ravenna, Ohio. This item can be shipped worldwide.